Gardening is fast-becoming an important part of what goes on at the Community Health Center, Inc. The health center has fostered a gardening culture for many years, but the last several months have seen a spike in activity due to the construction of the new building at 675 Main Street in Middletown. At the crown of this new building sits a tremendous rooftop garden, which features one of the largest self-sustaining living walls in the United States in addition to a plethora of vegetable and fruit plants. Flowers and herbs can also be found on the roof, and a tasteful, glass-walled conference room shares the space. The entire lot is encircled by a granite walkway, which provides an elegant touch to this calming garden plot. Spectacular views of downtown Middletown, the Connecticut River, and Arrigoni Bridge complete the scene. A garden committee was formed last year to help ensure that CHC’s rooftop jewel stays lush, and the facilities department does a great job maintaining the space as well. Today (October 1st) it still looks great as autumn rolls in. Efforts are underway to better preserve the garden during this coming winter, and it continues to capture the attention of more members of the CHC family. A wonderful treasure like our rooftop garden should be shared with the local community, and CHC is already in the process of making that a reality. We already have an ongoing alliance with MacDonough Elementary School, located right around the corner from the new building, where groups of young students have been coming to the roof and maintaining several plots full of fruits and veggies that has been set aside just for them. CHC will also host weekly movie nights for MacDonough students and their parents, one on each Friday of this month. Such events will bring more members of the community to our rooftop garden, and will continue to strengthen our ties with the area. We also have a group from MARC – a local agency that works with individuals with intellectual and developmental disabilities – that will be working on their own plot in the garden beginning this fall. Finally, tours have been planned to share this beautiful space with others. These great opportunities to experience the garden will be available in the very near future, so please stay tuned to our blog, Twitter handle, and other social media accounts to learn more about it! As proud as we at CHC are of our fantastic green roof atop the new main building, it not the only garden present on CHC sites. In fact, look no further than right across the street, at 634 Main Street, to find another lot filled with greenery. 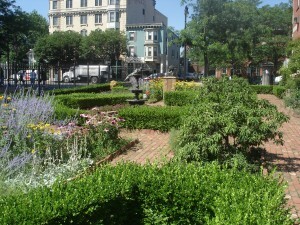 The Louie Lopez Herb Garden sits adjacent to the old Dental building (now home to IT, Communications, and Quality Improvement), and is a staple of the North End of Middletown. The garden is frequented by members of the community, and is not only easy on the eyes, but also a social spot for those living on upper Main Street. Every summer, CHC puts on a concert series in the garden for local residents to enjoy, and other events take place within its confines from time to time. Though it is noticeably smaller than our newer rooftop plot, the Louie Lopez Herb Garden is also kept in fine shape and is another focal point of the garden culture found at the Community Health Center, Inc. In the very recent past, CHC has begun to increase its scope from a gardening perspective in the city of New Britain, where another one of our major sites is located. For the first time this year, CHC has a FoodCorps member (one of our 14 HealthCorps Navigators) who is stationed at several schools across New Britain. Just the other day, the first raised garden beds were installed at Smalley Academy, which is a great early step for CHC’s gardening presence in another town containing one of our health centers. A photo of this development can be seen below. 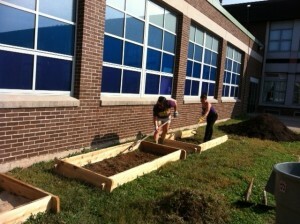 Look out for more blog posts detailing CHC’s growing garden culture in the near future!